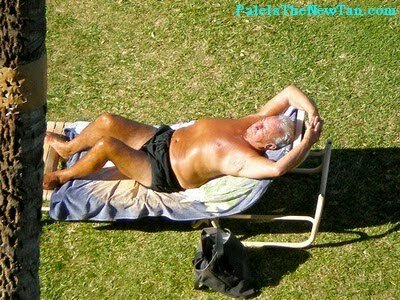 Pale Is The New Tan: Old fat men getting their tan on. Old fat men getting their tan on. On a side note, did everyone hear that United States health care reform is implementing a 10% tax on tanning coming soon? This should reduce tanning, and thus reduce skin cancer. Love how the old fat man is ogling old fat women in bikinis. Ladies, if you have rolls that could be used to hide money in, please wear a one piece! is that really a dude? Dear god, my eyes! That's a serious wedge going on there. Reader submission: "Bride of Carrot Top"
Reader submission: "She is a stunner . . ."
Uh is this dude serious?